Supernova 2016gkg in spiral galaxy NGC 613; color image taken by a group of UC Santa Cruz astronomers on Feb. 18, 2017, with the 1-meter Swope telescope. To date, no one has been able to capture the “first optical light” from a normal supernova (one not associated with a gamma-ray or x-ray burst), since stars explode seemingly at random in the sky and the light from shock breakout is fleeting. The new data provide important clues to the physical structure of the star just before its catastrophic demise and to the nature of the explosion itself. Sequence of combined images (negatives, so black corresponds to bright) obtained by Víctor Buso as SN 2016gkg appears and brightens in the outskirts of the spiral galaxy NGC 613. Labels indicate the time each image was taken. The object steadily brightens for about 25 minutes, as shown quantitatively in the lower-right panel. Credit: V. BUSO, M. BERSTEN, ET AL. She estimated Buso’s chances of such a discovery, his first supernova, at one in 10 million or perhaps even as low as one in 100 million. Filippenko and his colleagues obtained a series of seven spectra, where the light is broken up into its component colors, as in a rainbow, with the Shane 3-meter telescope at the University of California’s Lick Observatory near San Jose, California. Filippenko’s team continued to monitor the supernova’s changing brightness over two months with other Lick telescopes: the 0.76-meter Katzman Automatic Imaging Telescope and the 1- meter Nickel telescope. “The Lick spectra, obtained with just a 3-meter telescope, are of outstanding quality in part because of a recent major upgrade to the Kast spectrograph, made possible by the Heising- Simons Foundation as well as William and Marina Kast,” Filippenko said. Filippenko’s group, which included numerous undergraduate students, is supported by the Christopher R. Redlich Fund, Gary and Cynthia Bengier, the TABASGO Foundation, the Sylvia and Jim Katzman Foundation, many individual donors, the Miller Institute for Basic Research in Science and NASA through the Space Telescope Science Institute. Research at Lick Observatory is partially supported by a generous gift from Google. Astronomers have caught a supermassive black hole in a distant galaxy snacking on gas and then “burping” — not once, but twice. The galaxy under study, called SDSS J1354+1327 (J1354 for short), is about 800 million light-years from Earth. Our Milky Way galaxy’s supermassive black hole has had at least one burp. In 2010, another research team discovered a Milky Way belch using observations from the orbiting Fermi Gamma-ray Observatory to look at the galaxy edge on. Astronomers saw gas outflows dubbed “Fermi bubbles” that shine in the gamma-ray, X-ray, and radio wave portion of the electromagnetic spectrum. Other co-authors on the new study include postdoctoral fellow Francisco Muller-Sanchez of CU Boulder, Jenny Greene of Princeton University, David Pooley from Trinity University, Daniel Stern from NASA’s Jet Propulsion Laboratory in Pasadena, California, and Fiona Harrison from the California Institute of Technology. A paper on the subject was published in a recent issue of The Astrophysical Journal. Comerford presented the team’s findings in a January 11th, 2018 press briefing at the 231st meeting of the American Astronomical Society held in Washington D.C.
An international research team led by Université de Montréal astrophysicist Lauren Weiss has discovered that exoplanets orbiting the same star tend to have similar sizes and a regular orbital spacing. Astronomers at W. M. Keck Observatory have successfully met a major milestone after capturing the very first science data from Keck Observatory’s newest instrument, the Caltech-built Near-Infrared Echellette Spectrometer (NIRES). Knowledge of the spin evolution of stars can reveal a lot about the physics of all those processes, and astronomers have accordingly scrutinized the spins of stars in young open clusters, which provide an entire sample of stars of similar age. These studies have provided thousands of measurements of stellar spin, and there are models that go at least some way to explaining the spin evolution over stellar lifetimes. Before today’s paper, only two bona fide exoplanets had had their spins measured: Beta pic b and 2M1207 b. The authors of today’s paper elected to use spectroscopy to measure the rotation rates of three more planetary-mass objects on wide orbits. To link the physics of the planetary mass regime with the brown-dwarf-mass regime, they also looked at some brown dwarfs of similar age and spectral type. The authors’ tool of choice was the NIRSPEC spectrograph at the Keck II telescope. NIRSPEC allowed them to take spectra of sufficiently high resolution of water and CO absorption bandheads around 2.3 microns, and Keck’s 10-m diameter mirror allowed them to scoop up just about as many photons as they could from the ground. Upper left: Schematic of the K2-132 system on the main sequence. Lower left: Schematic of the K2-132 system now. The host star has become redder and larger, irradiating the planet more and thus causing it to expand. Sizes not to scale. Main panel: Gas giant planet K2-132b expands as its host star evolves into a red giant. The energy from the host star is transferred from the planet’s surface to its deep interior, causing turbulence and deep mixing in the planetary atmosphere. The planet orbits its star every nine days and is located about 2000 light years away from us in the constellation Virgo. Hot Jupiters. Credit: KAREN TERAMURA, UH ©IFA/Hawaii. Since astronomers first measured the size of an extrasolar planet seventeen years ago, they have struggled to answer the question: how did the largest planets get to be so large? Thanks to the recent discovery of twin planets by a University of Hawaii Institute for Astronomy team led by graduate student Samuel Grunblatt, scientists are getting closer to an answer. Gas giant planets are primarily made out of hydrogen and helium, and are at least four times the diameter of Earth. Gas giant planets that orbit scorchingly close to their host stars are known as “hot Jupiters.” These planets have masses similar to Jupiter and Saturn, but tend to be much larger – some are puffed up to sizes even larger than the smallest stars. The unusually large sizes of these planets are likely related to heat flowing in and out of their atmospheres, and several theories have been developed to explain this process. “However, since we don’t have millions of years to see how a particular planetary system evolves, planet inflation theories have been difficult to prove or disprove,” said Grunblatt. To solve this issue, Grunblatt searched through data collected by NASA’s K2 Mission to hunt for hot Jupiters orbiting red giant stars. These stars, which are in the late stages of their lives, become themselves significantly larger over their companion planet’s lifetime. Following a theory put forth by Eric Lopez of NASA’s Goddard Space Flight Center, hot Jupiters orbiting red giant stars should be highly inflated if direct energy input from the host star is the dominant process inflating planets. Using models to track the evolution of the planets and their stars over time, the team calculated the planets’ efficiency at absorbing heat from the star and transferring it to their deep interiors, causing the whole planet to expand in size and decrease in density. 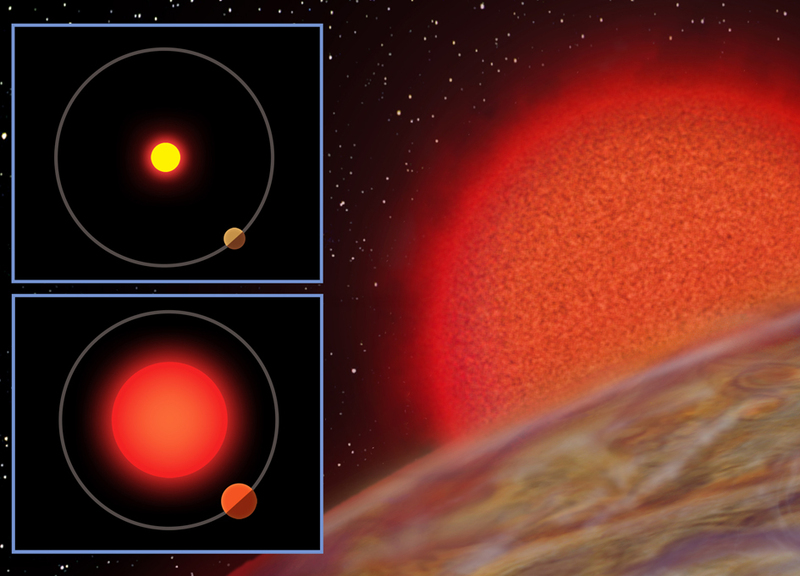 Their findings show that these planets likely needed the increased radiation from the red giant star to inflate, but the amount of radiation absorbed was also lower than expected. The search for gas giant planets around red giant stars continues since additional systems could conclusively distinguish between planet inflation scenarios. Grunblatt and his team have been awarded time with the NASA Spitzer Space Telescope to measure the sizes of these twin planets more accurately. In addition, the search for planets around red giants with the NASA K2 Mission will continue for at least another year, and NASA’s Transiting Exoplanet Survey Satellite (TESS), launching in 2018, will observe hundreds of thousands of red giants across the entire sky. Seeing double with K2: Testing re-inflation with two remarkably similar planets orbiting red giant branch stars. published in November 27th edition of The Astronomical Journal. The W. M. Keck Observatory works closely with several of NASA’s observatories, including the James Webb Space Telescope (not yet launched), Hubble Space Telescope, Chandra X-ray Observatory, and Spitzer Space Telescope. The Keck Observatory is privately owned; in 1994 NASA contributed to the observatory and has been a partner ever since. These next-generation space-based NASA missions, in combination with ground-based support from the world’s most scientifically-productive optical and infrared telescopes at Keck Observatory on Maunakea, Hawaii, will allow the nation’s scientists to obtain new knowledge from never-before-seen views of the universe. “NASA’s investment gives our science community a seat at the table for observatory governance and scientific planning, helping to shape the future observatory capabilities and operations model in a way that is highly beneficial to the NASA science program,” said Hashima Hasan, NASA program scientist for Keck Observatory. Current Keck Observatory observations are already characterizing targets, assembling input catalogs, and refining calibrations for Webb, Euclid, TESS, Europa Clipper, and WFIRST. With this agreement now in place, NASA and Keck Observatory will continue conducting scientific investigations specifically designed to advance quests to find habitable Earth-like exoplanets, unravel the mysteries of dark energy and dark matter, discover potential microbial life on Mars, and support future planetary missions, including a visit to Jupiter’s moon Europa. In the last five years alone, Keck Observatory has been critical in supporting a variety of NASA astrophysics and planetary space missions, such as Cassini, JUNO, Deep Impact (EPOXI), WISE, New Horizons, SOFIA, MESSENGER, LCROSS, and more. One prime example that garnered international attention is when NASA’s space observatory, Kepler, and Keck Observatory tag-teamed to verify the largest collection of exoplanets ever discovered. This led NASA to achieve one of its Level 1 science goals – a census of extrasolar planets with data so detailed that demographics of Earth-sized planets are included. “Keck Observatory has made critical contributions to the success of NASA’s Kepler/K2 mission, providing high-resolution imaging and spectroscopy to validate and characterize the masses and orbits of hundreds of exoplanets,” said Charles Beichman, executive director of the NASA Exoplanet Science Institute (NExScI) at Caltech. The NASA-Keck collaboration has also been instrumental in making 25 years of Keck Observatory data publically accessible via the Keck Observatory Archive (KOA). KOA capabilities have improved in recent years and it now serves as a repository of all the high-value data obtained at the Observatory. “It is a privilege to be able to give community-wide access to our data. We believe it is critical to share the scientific knowledge that we gain with the world, to help solve the hardest problems in astronomy,” said Lewis. Through this collaboration, NASA has access to one-sixth of the annually available observing time, to both 10-meter telescopes:; Keck I and Keck II. This observing time is available to the U.S. scientific community through a competitive allocation using a merit-based process. NASA partners with NExScI to carry out a Keck Guest Observing Program, implement KOA, and manage Key Science Mission Support Projects and other related activities. NExScI already has an open call underway for professional research proposals for NASA Keck observing time in Spring of 2018. The W. M. Keck Observatory operates the most scientifically productive telescopes on Earth. The two, 10-meter optical/infrared telescopes on the summit of Maunakea on the Island of Hawaii feature a suite of advanced instruments including imagers, multi-object spectrographs, high-resolution spectrographs, integral-field spectrometers, and world-leading laser guide star adaptive optics systems. The Observatory is a private 501(c) 3 non-profit organization and a scientific partnership of the California Institute of Technology, the University of California, and NASA.